We are a family that eats cheese all the time. And I'm not talking plain old American processed cheese, or even cheddar cheese. I'm talking Feta, Manchego, Gorgonzola, Irish Cheddar, Brie, Camembert, Stilton, and more. I'm talking raw milk and pasteurized milk from cows, goats and sheep. All five of us love cheese, and there's hardly a cheese that we've tried that we don't like! So when I was selected by BzzAgent.com to review President cheeses, I was delighted. President is one of the brands we regularly buy, because they have consistently great-tasting cheese. They've got over 75 years of experience and they're the #1 brand of Brie in France! 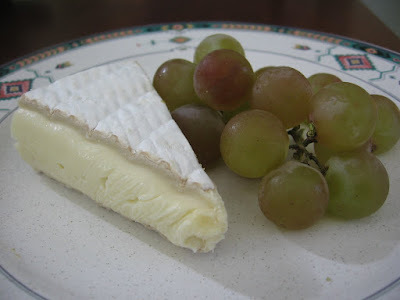 In the end,I chose a yummy wedge Brie, absolutely perfect with a cluster of seedless grapes. If you're feeling inspired, check out the President website from some great recipes and serving suggestions. Perfection! Save $1.00 on any President Specialty Cheese. Would you like to try President cheese? Just leave a comment on this post with your favorite cheese variety! I'll send the first 5 commenters a coupon for $1 off any President Specialty Cheese. Disclosure: I received a coupon for a free President cheese as well as 5 coupons for $1 off President cheese. I was not paid to review the product or give my opinions. The views and opinions expressed here are my own. Today, my favorite cheese is Spanish Manchego... let's see, tomorrow, how about a Camembert from France, and then the day after, an Roaring Blue from Australia... Thanks for the coupon! Hi Cheese Goddess! Thanks for leaving a comment. Unfortunately I can't figure out a way to contact you -- you don't have an email address on your Blogger profile and I can't leave a comment on your blog! Please send me your mailing address (bonggamom@yahoo.com) so I can mail you a coupon!